On a recent trip to the States, Aunt Aggy had recommended a frozen entrée from Trader Joe’s to me. 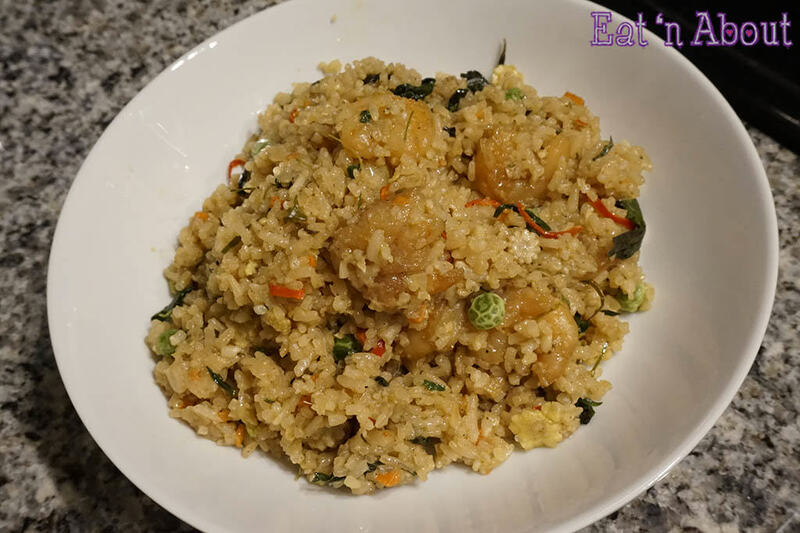 It’s the Trader Joe’s Spicy Thai Shrimp Fried Rice ($3.99USD I believe….). She had raved and raved about it so I had to try it. The shrimp portion is in a separate baggy from the rice blend portion, probably because they’re raw shrimp. 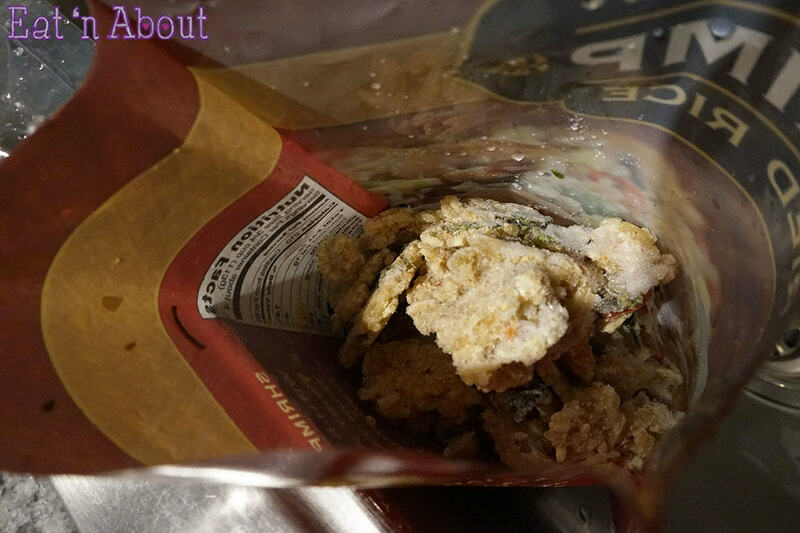 However they seem to be breaded or something, or at least seasoned. There were 10 pieces in total, decent sized. The rest of the rice blend portion is below. 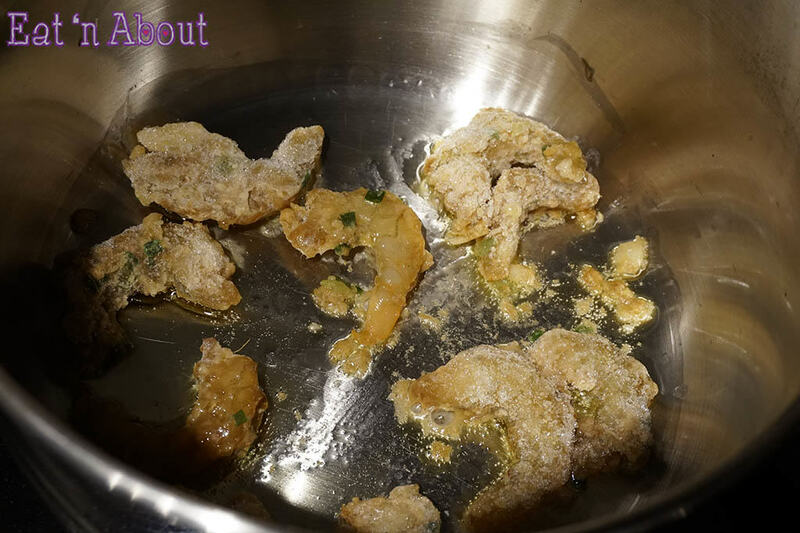 It looks like chunks of ice but you can clearly see the ingredients and herbs. Prominently there’s Thai red chili pieces, thai lime leaf, and basil leaf. Veggie-wise there’s peas, carrots, and baby corn. Preparation-wise, super easy. First, you heat up your saucepan with 1 tablespoon oil and cook the shrimp until just pink. I must say, whatever seasoning they had, it was incredibly aromatic and yummy-smelling. The Thai lime leaf was super fragrant and prominent. My mouth watered right away. 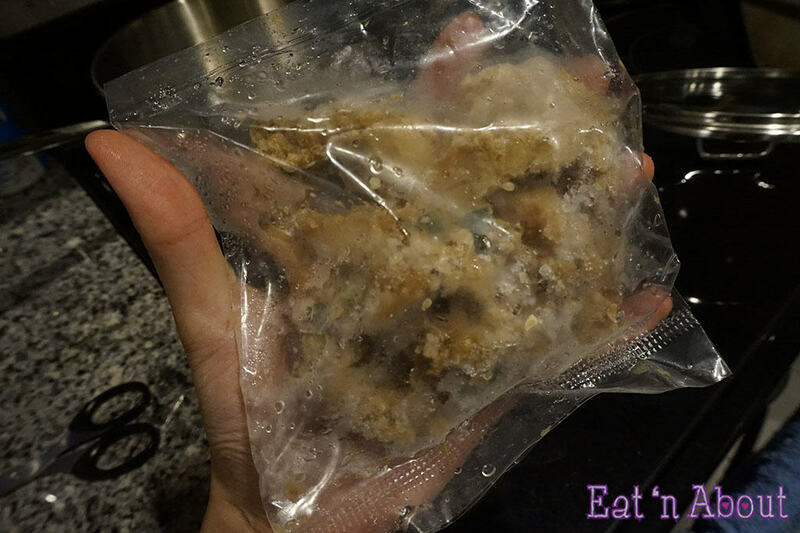 As you cook, the crusty seasoning sort of falls off. I think it’s on purpose for coating the fried rice blend afterwards. After the shrimp is cooked, you add the rice blend. They’re little chunky blocks of ice and I found I had to turn up the heat a little to thaw the chunks and heat everything through. Again here you can see all the ingredients. I was really impressed with the amount they put in. Stir-fry until heated through. 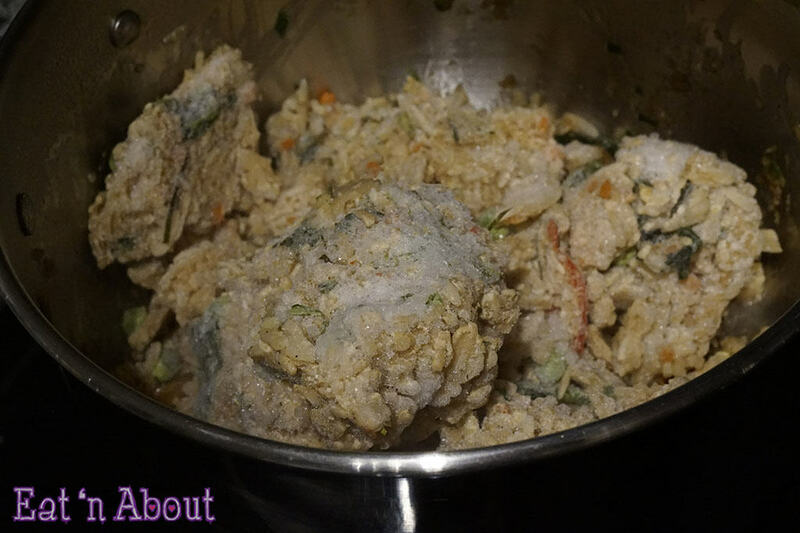 I found you never really achieve the authentic dry-ish “fried rice” state. It still ends up slightly mushy. But with the incredible aromatics, I can forgive that. This is probably the most authentically tasting “Thai” product from a non-Asian brand I’ve tasted, not saying I’m the authority on Thai food, but the spices were spot on. And the “Spicy” in the name really did translate in taste. I really did enjoy this product from Trader Joe’s and I will definitely get this again. It’s a very yummy and easy dinner. The package says serves 4 but realistically, it’s more like 2. 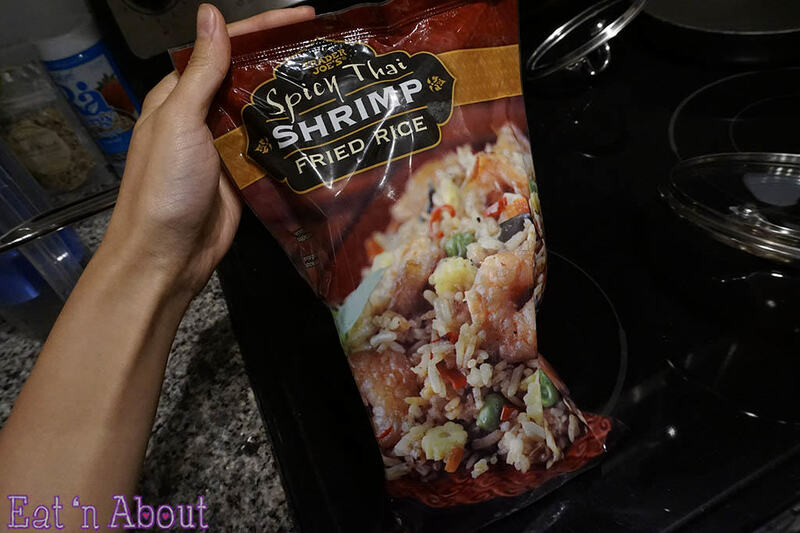 I hope they don’t discontinue or stop carrying this, like another product I love from them, the Trader Joe’s Thai “Dry” Chili Paste…..
Next PostXpocity Vancouver 2014 – A Girls Night Out! !